I’m still recovering from the elections, as most of us are. And I don’t even mean the actual vote or process, but the time I spent watching the numbers roll in. I’ve always loved Election Day…casting a vote and knowing I was part of something bigger than myself. But this year I spent so much more time watching than ever before. Of course, that has a lot to do with the fact that it was drawn out so much longer than any other election night before. Normally I’d easily be in bed before midnight. Midnight came and went. I was still up, waiting and watching, at nearly 2am. What’s weird about that is that I rarely even manage to stay up till midnight on New Year’s Eve! What’s infuriating is that 24 hours later, my state still doesn’t have all of the votes tallied and reported. Why? How? And it’s SO close! Not that it matters anymore, but I still want to know the results. On the upside of things… I managed to take a 2 hour nap yesterday to make up for my lack of election night sleep! It was clearly needed. Thanksgiving is and has always been one of my favorite holidays. A holiday that revolves around food?! I’m SO in. Yes, I know, it’s about so much more than just food. But, I’ve said it many times, food brings us together. Memories are made and shared around food. Turkey is essential. But the sides and dessert options are by far my favorites. Extra stuffing and potatoes please! And dessert… why can’t we just start with dessert?! Don’t save the best for last. Enjoy the best first! That way, you’re guaranteed to have plenty of room for your favorite sweet treat! 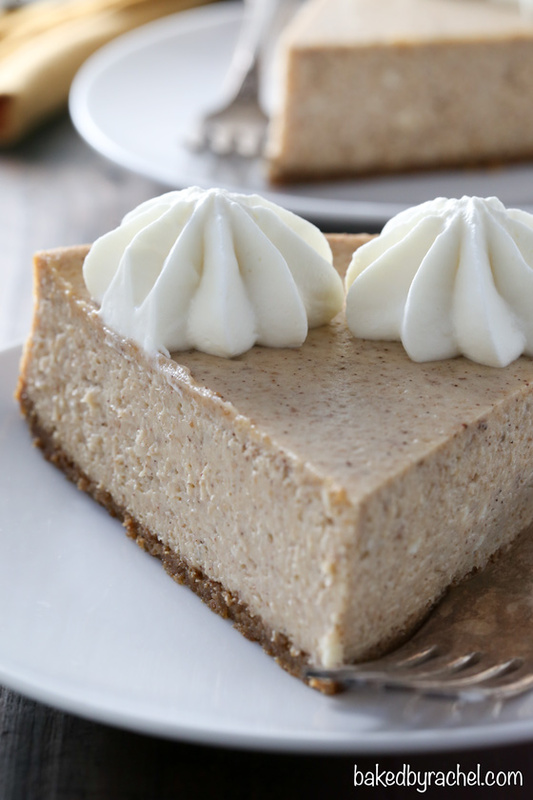 This cinnamon apple butter cheesecake screams Fall! If you love apples and cheesecake, this is an absolute must make. It would be an amazing addition to your holiday dessert table! 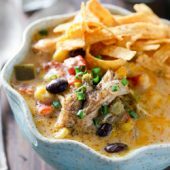 Easy, creamy and rich. 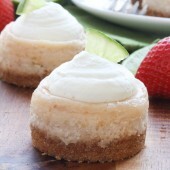 Cheesecake perfection! Homemade cinnamon apple butter cheesecake with a spiced graham cracker crust and sweetened whipped cream topping! A classic dessert with a fun seasonal twist! 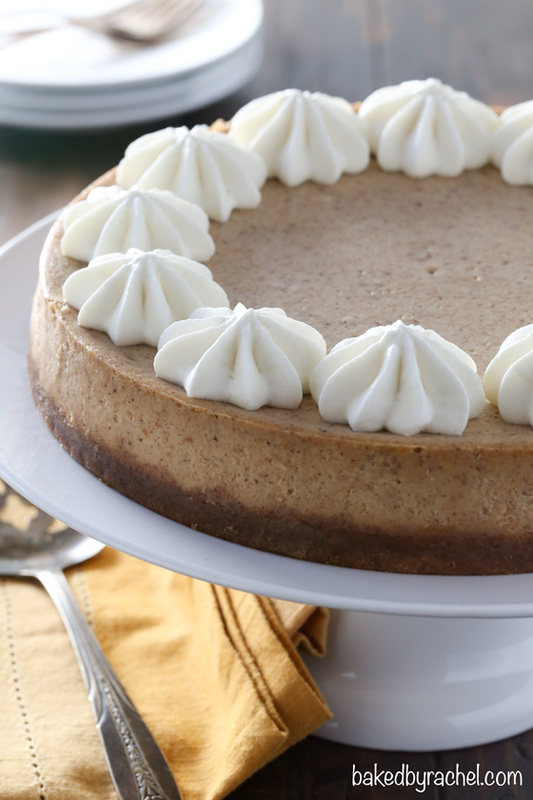 Add this apple butter cheesecake to your baking plans! Preheat oven to 350°F. Wrap the outside of a 9-inch springform with 2-3 layers of heavy duty foil Alternately, use a 9-inch cheesecake push pan placed inside of a 10-inch round cake pan. *Set aside. Add graham crackers to a food processor, blending until only fine crumbs remain. Alternately, graham crackers may be crushed in a plastic bag with a mallet or rolling pin. Add cinnamon and sugar to graham cracker crumbs. Pulse quickly to combine. Add melted butter, blend until fully combined and moist. Transfer to the prepared springform pan. Gently shake to evenly disperse crumbs. Use a flat buttom cup or meausing cup to press crumbs evenly over the bottom of the pan. Work from the center of the pan, working outwards. Bake at 350°F for 10 minutes. Set aside a large roasting pan, big enough to fit the cheesecake pan. 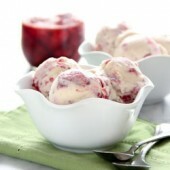 In a large bowl or stand mixer, beat cream cheese until smooth. With mixer running on low, add granulated and brown sugar, mixing until combined. Add vanilla and one egg at a time, beating until fully incorporated. Mix in apple butter and spices, mixing until fully combined and no streaks remain. Pour batter over pre-baked crust. Use an offset spatulat to smooth out the top, as needed. Add foil wrapped cheesecake pan to the roasting pan. Transfer roasting pan, with cheesecake, to the oven. 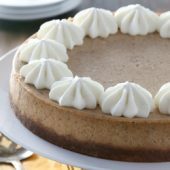 Add hot water to the roasting pan, being careful not to splash any water into the cheesecake or foil. Water should only go half way up the side of the springform pan. Bake for 45 minutes at 325°F. Turn off the oven, leaving the door closed. Let the cheesecake cook for an additional hour. Carefully remove the cheesecake from the oven. Cool completely to room temperature before transferring to the refrigerator to chill overnight. Carefully run a warm knife between the pan and the edge of the cheesecake. Release cheesecake from pan. In a medium bowl, beat together heavy cream, powdered sugar and vanilla until nearly stiff peaks form. Transfer whipped cream to a large piping bag fit with an open star tip. Pipe whipped cream around the edge of the cheesecake. Slice and serve. Store cheesecake in the refrigerator. Recipe serves roughly 12-16, yields 1: 10-inch cheesecake. *If a 10-inch round cake pan is available, wrapping the springform pan is not necessary. Springform pan may be placed inside of the cake pan and then into the water bath. I am with you Rachel–the sides and the dessert are most important. And this cake is bursting with the perfect fall flavors! I agree – we need something sweet and harmonious after this election ordeal. The combination sounds wonderful (the slow-cooker cinnamon apple butter, too) and I will give it a try. 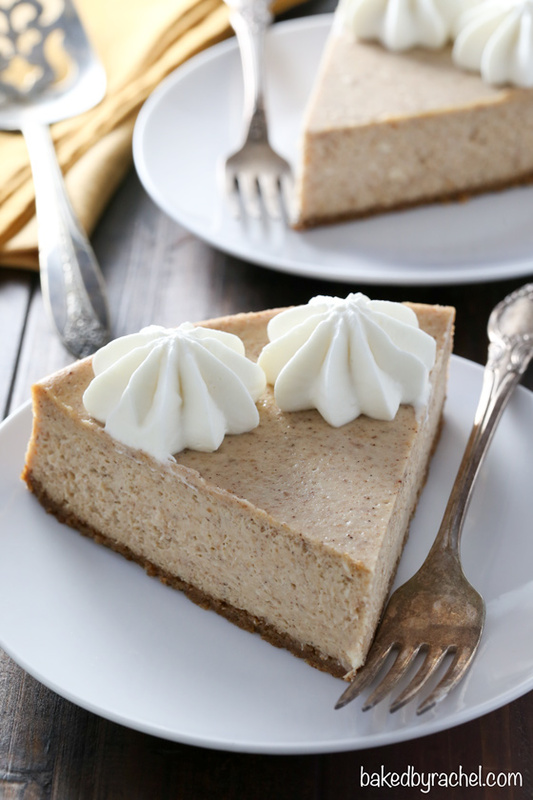 I’m a cheesecake fanatic so this needs to be in my fall repertoir! YES! 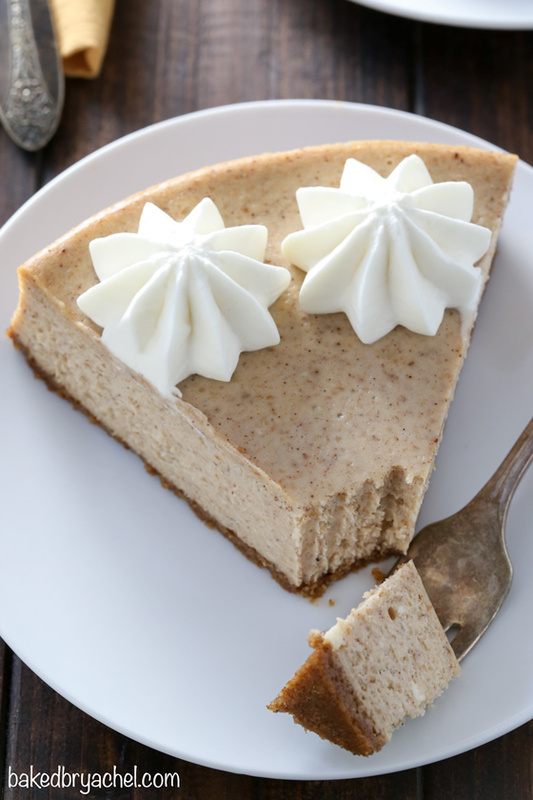 I am ALL about holidays that involve food – especially when said food is THIS decadently creamy and sinfully delicious looking cinnamon apple apple butter cheesecake! Wow – reading about the flavor alone is swoonworthy – then looking at that slice just makes me wanna dive right into my screen! I came across this on Pinterest, it looks incredible! I’ve never made cheesecake with a water bath before- will there be water left in the roasting pan when you remove it from the oven? Do you leave it to cool in the water bath, or move it to the countertop? Thank you!